Not suitable for Bobber, Bobber Black, Speedmaster 1200 nor Scrambler 1200. 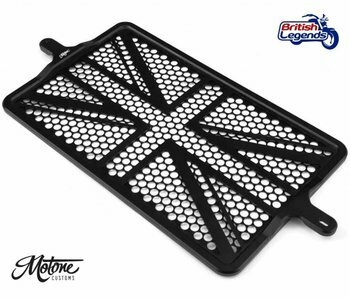 Made in England from 3mm-thick alloy sheet, laser-cut and stamp-formed, then anodized for a durable finish. Requires no modification of the bike (uses existing fixings points on the frame). 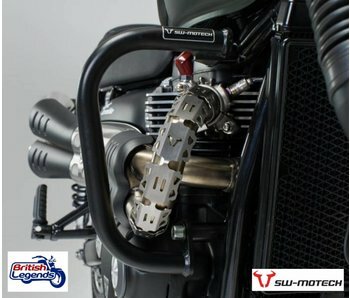 Sump guard for engine protection in solid aluminium, for Street Twin, Bonneville T100/T120 and Thruxton 1200/R. 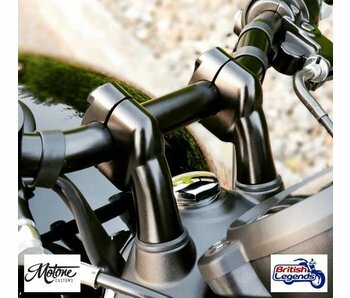 Engine protection bars in steel tubing, satin black finish. SW Motech brand, made in Germany.